Fiordland crested penguins or “tawaki,” are a sacred species for the Maori community, and one of six other penguin species found in New Zealand. Pablo Borboroglu takes his final strokes before reaching the coastline, his paddle plunges into the water like a warm knife sinking through butter. Milford Sound’s infamous torrential rains had cleared, allowing Pablo and other Global Penguin Society (GPS) conservationists, Thomas Mattern and Ursula Ellenberg, to easily glide their kayaks through the narrow valley of water. They are struck silent by the beauty of the landscape—a rainforest peppered with waterfalls lines the shores and snow-capped mountains find their twins mirrored in the still water—as they head towards land to find one of the rarest penguin species in the world. 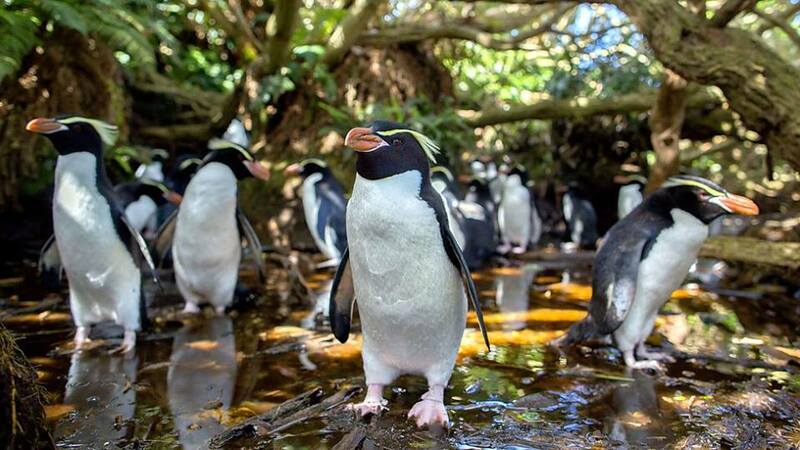 The GPS team is searching for the Fiordland crested penguin or “tawaki,” a sacred species for the Maori community, and one of six other penguin species found in New Zealand. With a population of only 3,000 pairs (Antarctica’s iconic emperor penguins boast over a quarter million pairs) this species is highly vulnerable; any disease or calamitous event could send their numbers plummeting. Though easily identifiable by its crests—bright yellow strips of feathers adorning its head like a pair of opulent eyebrows—finding one in the labyrinth of the rainforest is difficult. This is why in addition to being rare, the Fiordland crested penguin is also one of the least studied penguin species. Conservationists at GPS are trying to change this, particularly because learning about these penguins helps them better understand the health of the oceans. Once on land, the GPS team navigates through unending foliage and steep slippery hills until they find the penguins. 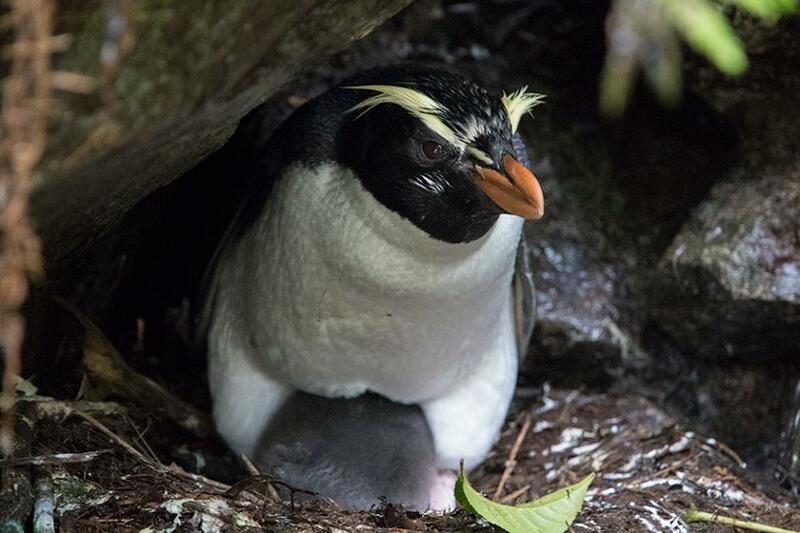 Fiordland crested penguins are hard to spot because they nest in the forest under rocks and fallen trees and in thick vegetation, but the conservationists still managed to tag 30 of them. GPS is keen to investigate how penguins use the oceans and how that intersects with current or future human activities, including fisheries, deep-sea mining activities and other developments on land that could affect ocean quality. The data they collect will help inform their work with New Zealand’s government to create a network of marine protected areas (MPA). GPS is highly successful at establishing marine protected areas. They helped create Argentina’s “Blue Patagonia”, a massive MPA protecting thousands of birds, fish, mammals, and plants in an area the size of Belgium. This year, Pablo won the prestigious Whitley Gold Award and a National Geographic/Buffett Award for Leadership in Conservation for such powerful contributions to conservation. Currently, he is working to develop two more MPAs in Chile and Argentina, which will protect huge swaths of ocean in key areas of biodiversity that are vulnerable to overfishing and pollution. This is why penguin conservation is so critical; researching and protecting penguins is a gateway to preserving the health of the oceans, which all life depends on. This makes every minute of the difficult search for Fiordland crested penguins worth the effort.